Having the Australians in the shape of Fleming's at Chelsea has always been a highlight for me because my visits to Oz have been some of the happiest times of my life. The team's professional yet friendly attitude at Chelsea is impressive, especially yesterday when Wes Fleming still managed to chat to me amiably whilst juggling the last minute frustrations of lack of frogs* and trying to get his mother into the showground. This year's move to the embankment site from their usual one has worked well by allowing them to build high rather than the usual digging down towards their homeland. I also loved the decision to favour Australia's native flora above their usual approach of showing off their enviable outdoor lifestyle. It reminded me of NAH's and my last trip to Oz ten years ago when we chanced upon similar vistas (though without the building in the shape of a Waratah) on our travels. So Fleming's depart on a high having scooped gold and best show garden in this morning's medals result. I for one am sad to see them go and wish them well for the future. Update: Since I published this post, there's been the usual furore over the judging at Chelsea. 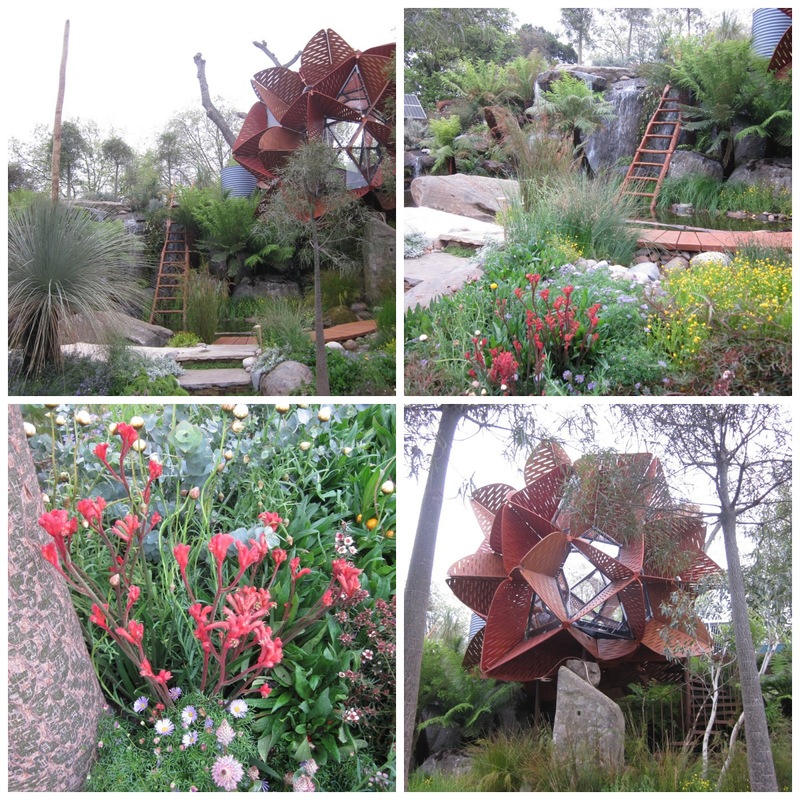 Christopher Bradley-Hole has helped create lots of publicity for his show garden for The Telegraph** by being openly critical of the judges' choice for Best in Show. It's interesting that his and the Fleming's garden both celebrate native flora, yet in very different ways. Fleming's is exuberant and colourful, whilst Christopher Bradley-Hole's is more restrained and self-contained with a design meant to be viewed from above. If that's the case it's a shame he didn't install a viewing platform similar to the one put in place for the Australian garden. The Fleming's garden is one of my favourites (Adam Frost's is another), yet The Telegraph's is one I hated. It seems to be a bit of 'marmite' garden, with the designers I've talked to loving it and ordinary gardeners like me having the opposite reaction. I found this garden too controlled, flat and claustrophobic. Driving into Bath on Wednesday I suddenly realised why that is. I much prefer the beautifully kept hedgerows with the cow parsley, dandelions and grasses of the verges waving at me as I drive by. They have the movement and life which the show garden lacks. I count myself very lucky to be able to see the real thing within a few yards of where I live instead of the controlled pastiche seen at Chelsea. I wonder if I lived in Australia with the landscape of the Fleming's garden as my everyday, would I feel the opposite about these two gardens? The sculptural element is very strong. Beautiful. Bren, I've learned since that the flower has a strong meaning for the designer as his parents proposal involved the flower. It's been great to see that this garden has such a personal meaning for the designer in describing his home garden, the sounds of it and other symbols like this one. Loved seeing this garden on the television, and so glad that they got gold in this their last visit. Wishing them every success for the future. How did you manage to find The Telegraph Garden "claustrophobic" when you were not intended to be inside it? Easy - a combination of a dull day and a dull garden. The charred oak surround didn't help either. However, I also understand why you and Ann liked it. I respect your opinion and I hope you'll do the same with mine. As I said, I have the joy of the real thing here.